When I work out, I greatly prefer the work to be literally out. Outside, that is. Running and hiking, my favorite sweaty indulgences, cry out for fresh air, even when the weather is wet and windy. I may come home drenched, but I'm always more vibrantly alive, and I know I've accomplished something. I've gone somewhere. That matters. Unfortunately, at 53, my feet can no longer handle daily pavement pounding, so for the last two years, I've added a bicycle to my exercise regimen, and here I have to admit to being a fair-weather exerciser. It's not that I can't ride in the rain, and if the temperature's not too low, I frequently do. When it's also windy and dark, though, I begin to worry about whether the other vehicles on the road--those weighing tons, rather than the few pounds of my bike--can see me, or avoid me. On days like those we've been having lately, I take my workout indoors to a spin class at 24 Hour Fitness; and if there's no class to be had on a given day, I take myself to the spin room and create my own class. Look closely, and you should be able to understand my confusion as I viewed this in a mirror from across a large room. The parody is not as precise as it was in the Battlestar Galactica version from a few years ago, but there are just too many parallels for it to be a coincidence. The varied colors of the jerseys roughly match those of Leonardo's disciples, even to the red on the central player. 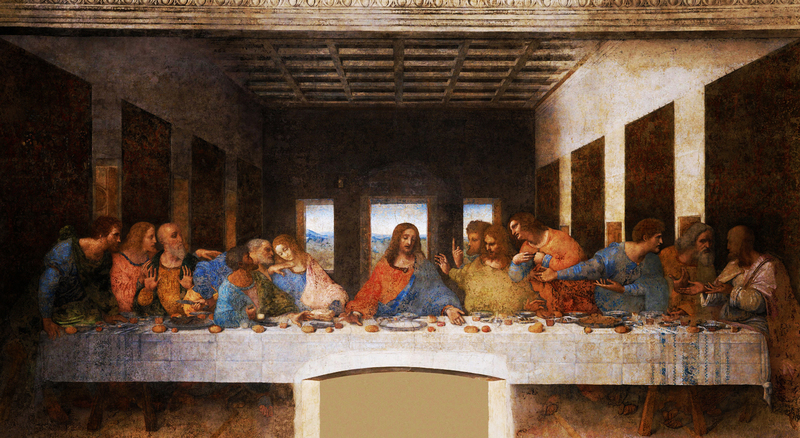 The players' postures also mirror those in The Last Supper, with bodies angled in a reflection of the disciples' confusion as Jesus announces one of them will betray him. The sky in the background, the architecture of the stadium, the dimensions of the poster, even its inadvertent placement in the gym, all evoke a sense of familiarity for what is probably the most iconic work of Christian art in the history of western civilization. Add to this the fact that the poster is promoting an all-Sunday-long celebration of America's favorite sport, and the message rings as clearly as a muezzin calling from a minaret: The hour has arrived! Gather in the sacred place for prayers! I write frequently about football. I've called it a blood sport, speculated that the impulses we channel into it are the same punished by Noah's flood, considered the possibility that the game is an expression of male aggression, among other meditations on the pastime that comes closest to being America's true religion. I call football religion as one who has been both a scholar and practitioner of religion. While all organized sports have trappings that mirror religion--the devotion of adherents, the practice of rituals, the regularly scheduled gatherings for worship, and the endless analysis by professional thinkers about the philosophy, polity, and praxis of the faith--football most wholeheartedly embraces the metaphor. It's not just the format, either: the content of football is filled with religious themes, many of which, if they were presented in a church tract, would cause a skeptic to turn away in disgust. As band director of Banks High School for two years, I was present for every home game of a winning football team, and witnessed first hand devotion expressed to a Pentecostal extent. I also saw young men crash into each other with impacts that made me wince, and on one occasion, watched a teenager carried off the field to a waiting ambulance. The college games playing yesterday at the gym were frequently put on hold while medics worked on a fallen player who, if he was lucky, would limp off the field, and if not, would leave by stretcher. Injuries to limbs, backs, necks, and most upsetting, to brains are stock in trade for football, and often lead to lifelong impairments. As I hope I made clear by talking about high school players, this is not just about wealthy star quarterbacks. We put children in pads and helmets and send them out on football fields to crash into each other, calling it PeeWee league. Only a tiny fraction of those who play this game ever see any financial compensation at all for the risks they take and the health they sacrifice. This religion practices sacrifice in a way that modern, "civilized" religions have mostly abandoned or, barring that, rendered so symbolic as to remove any sense of life actually being laid down for atonement or devotion; but every Friday, Saturday, Sunday, and Monday children and young men give up legs, arms, sanity for America's True Religion. Here's a more prosaic parallel: a common criticism of institutional religion is its obsessions with rules of behavior, and the creative ways in which its adherents subvert those rules. Consider the lengths to which United Methodist pastors and administrators will go to pretend to be both honoring the letter of the Discipline while looking the other way so that gay and lesbian pastors can maintain their ordination, or the huge majority of Catholics who practice birth control. Now take a moment to think about how blatantly coaches manipulate time out rules to stop or run out the clock, and how much time is spent at any game with referees consulting on whether or not a rule applies to a given play. Consider also the pageantry of the sport: cheerleaders, fireworks, jet planes flying overhead, the presentation of the highest honor upon a dais shaped like an enormous football. The money we spend on these frills and googaws is mind boggling; and yet, when one considers the finery that makes medieval European cathedrals so gorgeous, most of it purchased through the sale of indulgences to peasants, it's hardly unprecedented to pour so much treasure into an object of devotion. For all its violence, football also creates a space for young men to learn and practice teamwork, the sense that all are a part of advancing toward a goal and of defending one another from opposing forces, but this also feeds into what is, perhaps, the most disquieting aspect of the football religion: of all organized sports, none works better as a metaphor for eschatological conflict. Football strategy is like trench warfare. Advances are usually numbered in yards, sometimes feet, unless a breakthrough can be achieved. Each team has just one piece of artillery--the quarterback--who, when adequately defended, can launch a long-range assault on enemy territory. When opposing teams engage, bodies crash into each other, often piling on top of each other like something one might see on a battlefield. Individual games are like battles leading up to a final, apocalyptic confrontation during which the two surviving armies go at each other with all they have, for there can, in the end, be only one winner, one force vindicating the devotion of its adherents; the rest, all the teams, all their fans, are cast off into the outer darkness to weep and gnash their teeth until the cycle begins again the following season, and the harvest of limbs, brains, and dollars recommences. Blood sport, blood religion: however you think of it, there's nothing more American than football. Whenever I'm at the gym, in a bar, or anywhere that football's on the TV, I feel the pull of it. I can't keep my eyes off the screen, can't help feeling the thrill of an advance, wincing at the crunch of bodies, suffering along with the paschal sacrifice of yet another athlete's femur, vertebra, cranium. I feel it, but I rarely succumb; for as with institutional religion, I have chosen not to embrace the wholehearted surrender of myself to idolatry, however tempting it may be.